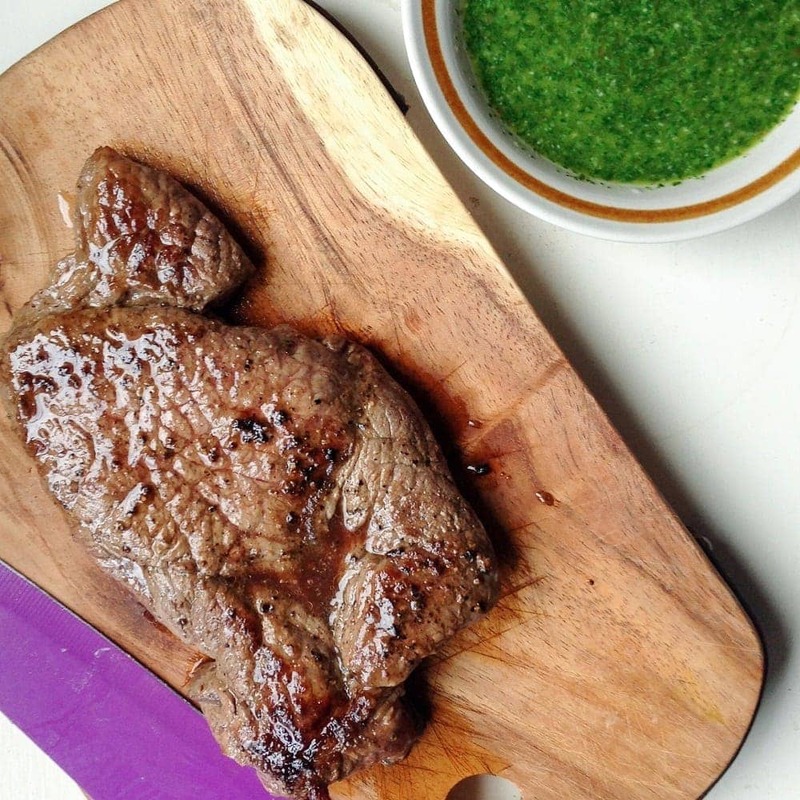 For this chimichurri steak sandwich the steak is sliced and served with caramelised onions, spinach leaves and a chimichurri dressing. I’m pretty sure this was the first time we’ve cooked steak at home since we moved to London a year and a half ago. We both love steak but it’s too expensive for us to buy most of the time. Fortunately, the shop at the end of our road often has meat on offer and Will is excellent at finding the bargains. So when they had some sirloin steak on offer a few weeks ago we were pretty excited. On Saturday we decided to defrost the steak and make some sandwiches. 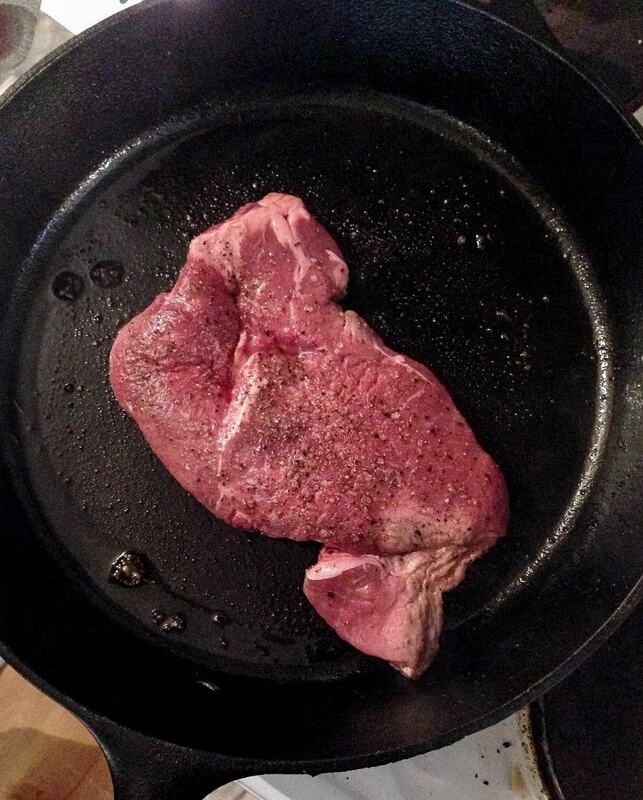 We cooked the steak in our favourite new cast iron skillet. We had it medium-rare but obviously you can cook it however you like it. I threw together a chimichurri dressing to have over the top of the steak which was super herby and flavourful. Will caramelised some onions to go in the sandwich which was an excellent choice on his part because who doesn’t love caramelised onions in everything? Ooo yeah look at that juicy steak. Finally, we added some cheesy garlic wedges just to make the meal extra indulgent. This was a pretty easy side. Just line a baking tray with some foil and top with the chopped potatoes, garlic, salt and pepper, oil and chilli flakes before wrapping them in the foil and cooking for half an hour. The beauty of this meal is that it has the indulgence of a weekend meal but the cooking time of a weeknight dinner. 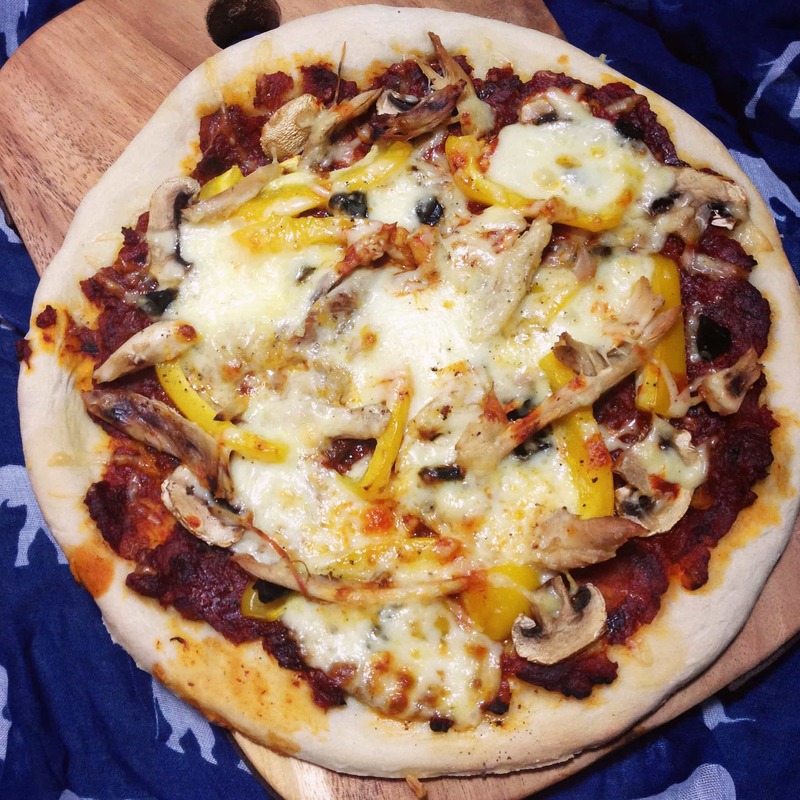 Just choose whether you need indulgence on a weeknight or quick and easy at the weekend! Preheat the oven to 200°C. Spread a large piece of foil on a baking tray. 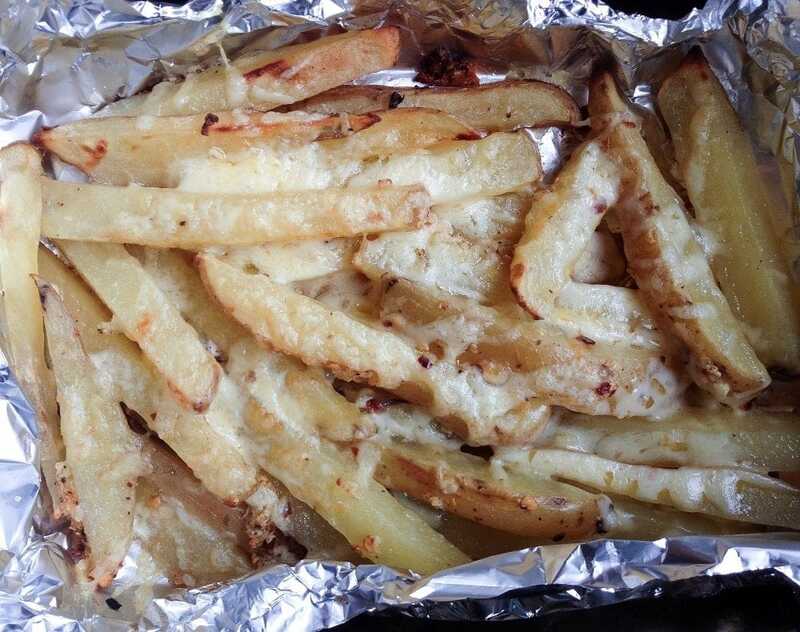 Place the potato on the foil with the oil, garlic, chill flakes and a good sprinkling of salt and pepper. Place in the oven and cook for 35 minutes. Once they're cooked, remove from the oven and open the foil package. Cover with the cheese and return to the oven for 5 minutes until cheese is melted. 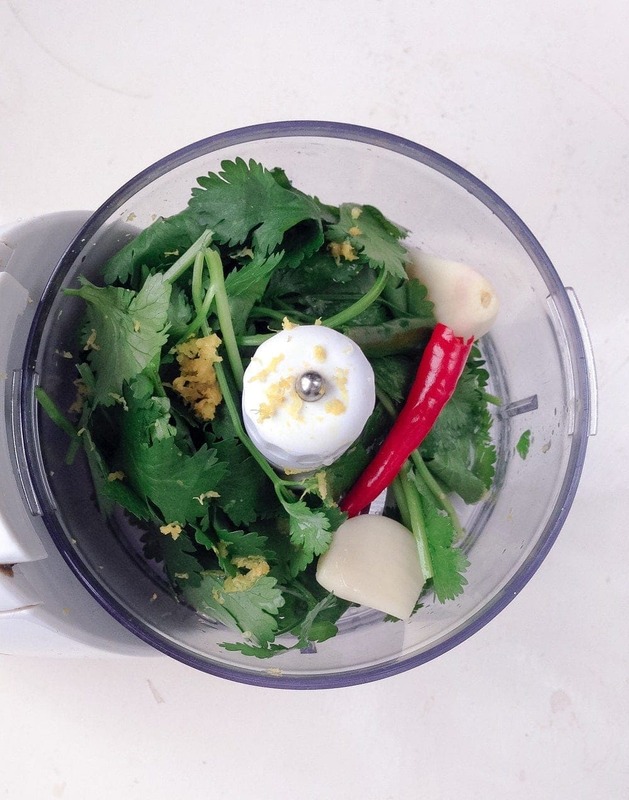 Place all the chimichurri ingredients into a mini blender and blend until smooth. Set aside until ready to use. Heat a tbsp of oil in a frying pan or skillet to a medium heat. Add the onions and cook slowly for 5 minutes before adding the sugar and cooking for another 5 minutes until caramelised. Remove the onions from the pan and set aside until ready to eat. Heat a little more oil in the pan and turn the heat up to high. Pat the steak dry and cover both sides in salt and pepper. When the oil is almost smoking add the steak and cook it to your desired level of doneness. Slice before serving. Slice open the baguette and fill with the steak, spinach, chimichurri and onions. Serve with the wedges. WONDERING WHAT TO DO WITH THE LEFTOVER INGREDIENTS YOU’VE GOT FROM MAKING THIS Chimichurri Steak sandwich with garlic wedges? Use up the coriander in this Korean Pork Banh Mi. You can add leftover potato to this chorizo chilli. Add the other half of the lemon to this honey saffron chicken.